May is Asian Pacific American Heritage Month (APAHM), a nationally recognized time to celebrate, acknowledge, and educate on the many achievements and contributions of Asian Americans and Pacific Islander Americans to the United States’ history, culture, and society. May was chosen as APAHM due to two important historical dates and events relating to the contributions of Asian and Pacific Americans to the U.S. taking place in May. First, May 7, 1843 is the date the first Japanese immigrants to the U.S. arrived. Second, May 10, 1869 is when the transcontinental railroad was completed; many Chinese immigrants labored laying the tracks. Asian Pacific Americans are Americans with Asian or Pacific Islander ancestry. According to the U.S. Census Bureau 2005-09 American Community Survey there are 13,201,056 Americans of Asian descent and 447,591 Americans of Native Hawaiian and Other Pacific Islander descent residing in the U.S.
Russia, Georgia, Armenia, Azerbaijan, Kazakhstan, China, Taiwan, Mongolia, Japan, Vietnam, South Korea, North Korea, Thailand, Myanmar (Burma), Bhutan, Laos, Cambodia, Singapore, Malaysia, Brunei, the Philippines, Indonesia, Timor-Leste (East Timor), India, Nepal, Bangladesh, Sri Lanka, Pakistan, Afghanistan, Tajikistan, Kyrgyzstan, Maldives, Turkey, Cyprus, Lebanon, Israel, Jordan, Syria, Iraq, Iran, Kuwait, Bahrain, Qatar, Saudi Arabia, United Arab Emirates, Yemen, Oman, Turkmenistan, and Uzbekistan. Polynesia = New Zealand, Hawaiian Islands, Rotuma, Midway Islands, Samoa, American Samoa, Tonga, Tuvalu, Cook Islands, French Polynesia, and Easter Island. Melanesia = Papua New Guinea, New Caledonia, Vanuatu, Fiji Islands, and Solomon Islands. Micronesia: Mariana Islands, Guam, Wake Island, Palau, Marshall Islands, Kiribati. APAHM began as a ten day annual celebration and has grown into a month long event. Each year the theme for APAHM is selected by the Federal Asian Pacific American Council. The theme chosen for APAHM 2012 is "Striving for Excellence in Leadership, Diversity and Inclusion." The theme was chosen to focus on the Executive Order on Diversity and Inclusion signed by President Obama on August 18, 2011. June 1977 Representatives Frank Horton of New York and Norman Y. Mineta of California introduce a House resolution calling for President Jimmy Carter to declare the first ten days of May Asian Pacific Heritage Week. July 1977 Hawaii’s Senators Daniel Inouye and Spark Matsunaga introduce a bill calling for President Jimmy Carter to designate the first ten days of May Asian Pacific Heritage Week. October 1978 President Jimmy Carter signed a joint resolution on October 5, 1978 proclaiming the first ten days of May as Asian Pacific Heritage Week. May 1990 President George H. W. Bush extended the celebration of Asian Pacific Heritage Week to a month long commemorative calling it Asian Pacific American Heritage Month. 1992 May is officially designated Asian Pacific American Heritage Month. The Vietnam Archive is proud to preserve and make available to the public the records of Families of Vietnamese Political Prisoners Association (FVPPA), donated by the Vietnamese American Heritage Foundation (VAHF). By writing and petitioning U.S. and foreign government officials and agencies, and raising funds and public awareness of the plight of Vietnamese political prisoners, the FVPPA gave voice to thousands of these refugees, former U.S. allies and employees, and their families who might otherwise have been forgotten. By helping approximately 10,000 former Vietnamese reeducation camp detainees and their families immigrate and settle in the U.S., the archival records of the FVPPA have become a vital key to understanding the Vietnamese American immigration experience. After her life was tragically affected by the war in Vietnam, Mrs. Khuc Minh Tho dedicated herself to helping others begin a new life, as she did, in the United States. After the fall of Saigon in April of 1975, her husband, Nguyen Van Be, a colonel in the Army of the Republic of Vietnam (ARVN), was sent to a reeducation camp, where he would spend the next thirteen years. U.S. former allies and employees were sentenced to reeducation after the Fall of Saigon. In 1975, with her second husband still incarcerated, Khuc immigrated to the U.S. In 1977, in order to win the release of her husband and all Vietnamese political prisoners, Khuc, along with other spouses, children, relatives, and friends of Vietnamese prisoners, founded the Families of Vietnamese Political Prisoners Association (FVPPA) in Arlington, Virginia. Khuc has served as president of the association since its inception, working for the release of Vietnamese reeducation camp prisoners and their immigration to the U.S. through the United Nations High Commissioner for Refugees (UNHCR) Orderly Departure Program (ODP). They petitioned Congress and lobbied the State Department on behalf of Vietnamese refugees. The FVPPA’s stated purpose was to "promote the reunion of political prisoners with their families in the U.S. and elsewhere in the free world." The group also sought to raise public awareness of the plight of political prisoners. Under Khuc’s leadership the FVPPA helped approximately 10,000 former Vietnamese reeducation camp prisoners and their families immigrate to the U.S. Khuc Minh Tho’s work on behalf of her countrymen resulted in several significant achievements that paved the way for Vietnamese immigration and success in the United States. Following the FVPPA’s meeting with the Permanent Mission of the Socialist Republic of Vietnam in New York in April 1989, the U.S. and Vietnam signed an agreement allowing former reeducation camp prisoners and their families to resettle in the U.S. in July of that year. Funded by a grant from Amnesty International, the organization developed a list of the one-hundred longest-held Vietnamese political prisoners and worked for their release. Their lobbying efforts also led to the passage of the McCain Amendment (Section 595 H.R. 3540) in 1996, which allowed children of former Vietnamese political prisoners over the age of twenty-one to immigrate to the U.S. Their efforts also led to the elimination of the requirement that former Vietnamese political prisoners have six months trade and English training in the Philippines before entering the U.S. In an interview with The Orange County Register in 1989, Robert Funseth, Senior Deputy Assistant Secretary of State, credited Khuc Minh Tho with being "the guiding light behind the movement to free Vietnamese who were held in communist reeducation camps." Funseth felt so strongly about Tho’s efforts that he presented her with a plaque and the ball point pen he used in Hanoi to sign the agreement between the U.S. and Vietnam in July of 1989. Still very active in the Vietnamese American community, Khuc Minh Tho currently serves as chairwoman of the Vietnamese American Heritage Foundation. On December 15, 2009 Mrs. Khuc Minh Tho became the second person to be interviewed for the Vietnam Archive’s Vietnamese American Heritage Oral History Project. Mrs. Khuc’s interview documents her inspiring life of courage, perseverance over great adversity and loss, heart, and dedication to helping others. Ambassador Sichan Siv was born on March 1, 1948 (year of the Boar 2490) in Phochentong. As a young man in Cambodia he worked for CARE (Cooperative for Assistance and Relief Everywhere) to help refugees during the Vietnam War. After surviving the killing fields of the Khmer Rouge and losing his entire family he escaped to Thailand where he helped his fellow prison inmates and fellow refugees living in a Thai refugee camp by teaching English (before being placed in a refugee camp he was imprisoned for illegal entry into Thailand because he no longer had any ID or documentation). Once the Ambassador immigrated to the U.S. in 1976 he continued his humanitarian efforts and worked to help refugees from his position as Deputy Assistant to the President for Public Liaison and U.S. Ambassador to the United Nations. Ambassador Siv worked against human trafficking and worked to help people from cradle to grave. The humanitarian efforts of Khuc Minh Tho and the FVPPA were aided by Ambassador Sichan Siv, former Deputy Assistant to President George H. W. Bush for Public Liaison and US Ambassador to the UN General Assembly and Security Council. Ambassador Siv was the first Asian native to be appointed Deputy Assistant to President. In this role Ambassador Siv was instrumental in assisting Mrs. Khuc Minh Tho and the FVPPA solicit support from the Executive Branch of the U.S. government and bring to its attention the issues regarding Vietnamese refugees and Vietnamese reeducation camp prisoners. 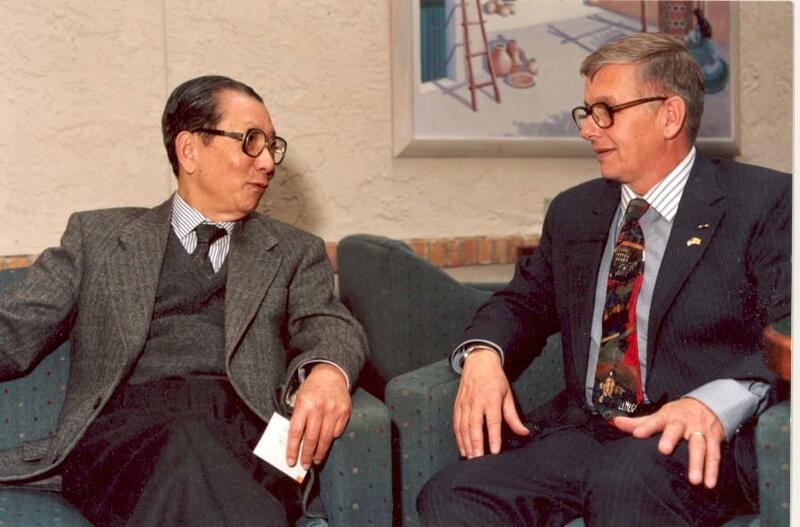 A former refugee himself, Ambassador Siv was a key player in bringing larger Asian issues before the Executive office. On March 12, 2009 Ambassador Siv was the first person to be interviewed for the Vietnam Archive’s Vietnamese American Heritage Oral History Project. Ambassador Siv’s interview documents his incredible life journey of faith, hope, love, and perseverance over great adversity and loss. Ambassador Siv currently resides in San Antonio, Texas, with his wife Martha Pattillo Siv who is from Pampa, Texas. On September 25, 2002 Ambassador Phong Xuan Nguyen participated in the Vietnam Archive’s Oral History Project. Phong, originally from the village of Bac Tri in southern Vietnam, served in a variety of posts in the government of the Republic of Vietnam (RVN). Born in 1936, Phong was educated at the Lycee Chasseloup Laubat in Saigon, the Lycee Michelet in Paris, the University of London, and Oxford University. Upon graduation from Oxford in 1960, he returned to Saigon to work for Esso, an affiliate of Standard Oil New Jersey, as an executive in charge of industrial relations. He joined the South Vietnamese government in 1965, at age 29, as Minister of Labor (1965-66). He subsequently served as Minister (Chief of Staff) at the Prime Minister's Office (1966), as Minister of Welfare (1966-68), and as the first Chieu Hoi Minister (1967-68). In 1968, he was named Deputy Leader of the RVN's delegation to the Paris Peace Talks. He later became Minister-in-State in Charge of Negotiations in Paris and then Head of the RVN at the Conference between the Two South Vietnamese Parties at Celle Saint Cloud. Phong returned to Saigon in April of 1975. After the fall of the RVN to the North Vietnamese, he was sent for "reeducation" in May 1975. He spent nearly five years in prison outside of Hanoi in Camp A15 before being released in January 1980. Afterwards, he worked in Ho Chi Minh City as a private businessman. On January 23, 2011 Tran Thi Thanh My (Mindy Elliott) became the first person who had immigrated to the United States through the United Nations High Commissioner for Refugees’ (UNHCR) Orderly Departure Program (ODP) with the assistance of the Families of Vietnamese Political Prisoners Association (FVPPA) to participate in the Vietnam Archive’s Vietnamese American Heritage Oral History Project. Tran Thi Thanh My was born on June 26, 1964 and was a young, single mother when she left Vietnam and immigrated to the U.S. in search of a better life for her and her young son, Trieu Luu. In Vietnam she had been denied an education because her father, Tran Van Man, a former ARVN (Army of the Republic of Vietnam/South Vietnam) Colonel was a political prisoner interned in the Socialist Republic of Vietnam's reeducation camps from June 15, 1975 (some records say April 30, 1975) through April 29, 1992. While her father was incarcerated Tran Thi Thanh My and her sister survived by doing nails in their home. After five years of hard work and scraping together money she opened a coffee shop, but continued to do nails in order to support her small son. After nearly seventeen years of incarceration her father was released and with the help of the FVPPA Colonel Tran was able to immigrate to the U.S. through the UNHCR's ODP, and bring her and her son along with him. Tran Thi Thanh My resettled in Texas and adopted the English name Mindy. Mindy passed her U.S. citizenship test, earned her license to become a hairstylist, and now owns and runs her own hair salon. Mindy met her husband Dan Elliott, a Vietnam Veteran, in her salon. He was one of her clients. Mrs. Elliott’s father, Colonel Tran, passed away in 2002. Dan Elliott contacted the Vietnam Archive’s Vietnamese American Heritage Archivist, Ann Mallet,t to search for and obtain a copy of Tran Van Man’s ODP application in order to assemble records for their grandchildren, Colonel Tran’s great grandchildren. Colonel Tran was born on December 18, 1934 in Vinh Long (Some of his papers say My An Hung, Sadec). Colonel Tran had worked most of his career in the South Vietnamese equivalent of the CIA, and had U.S. intelligence training in Malaysia and Okinawa. He enjoyed taking his family to the Kowloon Theater Performances and always had front row seats. Mindy has many fond memories of her father taking her to the theater to watch the performances as a young girl. Kowloon performances are still one of her favorite programs to this day. Mrs. Elliott’s mother died when Mindy was small, only three years of age, but fortunately she had a good step-mother, Nguyen Thi Ngoc Xuan. Mindy’s brother-in-law, Nguyen Van Tam, who’s documentation is also found in Colonel Tran Van Man’s ODP Application file, lost his leg in the 1972 Easter Offensive and was discharged from the service. He spent approximately one and a half to two years in the reeducation camps. Mr. Nguyen and Mindy’s sister are still in Vietnam. They make and sell clothing from their home and still hope to emigrate to the U.S. Lieutenant Colonel Thanh Chieu was born in 1927 in Tam Ky, Vietnam. He entered the Military Academy in Da Lat in 1951 and served in the Army of the Republic of Vietnam (ARVN) (South Vietnam) until he resigned in 1963. Until the end of the war in April of 1975 Colonel Chieu engaged in various businesses in and around Tam Ky. After the war Colonel Chieu was incarcerated in the Socialist Republic of Vietnam’s reeducation camps. Chieu emigrated from Vietnam in 1990 and is now a US citizen. Tran Thanh Chieu participated in the Vietnam Archive’s Oral History Project on August 18, 1999. Ambassador Bui Diem, nephew of Tran Trong Kim who served as Prime Minster during the reign of Emperor Bao Dai, was born in 1923 and served as the Republic of Vietnam’s (RVN/South Vietnam) Ambassador to the United States during President Nguyen Van Thieu’s administration. Ambassador Diem’s incredible career includes being a member of the delegation to the 1954 Geneva Conference, Chief of Staff to Prime Minister Phan Huy Quat in 1965, Ambassador to Washington from 1967-1972, Ambassador at Large until the Fall of Saigon in April of 1975, and founder of the Saigon Post. In 1975 while in the U.S. lobbying to obtain $700 million in emergency aid for South Vietnam, Ambassador Diem relocated his wife and three children to the U.S. On April 17, 1975 Ambassador Diem returned to Saigon alone. Less than two weeks later, he participated in Operation New Life and flew out of Vietnam on April 28th, with his mother and two sisters, a mere two days before Saigon fell. Ambassador Diem is now a U.S. citizen and on October 29, 1999 he participated in the Vietnam Archive’s Oral History Project. Vietnamese Americans are the 4th largest Asian American group in the U.S. Vietnamese-Americans comprise more than half of all overseas Vietnamese. In April of 2009 the 111th U.S. Congress, 1st Session, designated a specific day within APAHM 2009 dedicated to acknowledging and celebrating the heritage of Vietnamese Americans who immigrated to the US as refugees after the fall of Saigon in April 1975. 72% of Vietnamese Americans are naturalized citizens and Congress wanted to commemorate the experiences of Vietnamese Refugees and the contributions they have made to American society and culture. Congress chose May 2nd as Vietnamese Refugee Day to coincide with the May 2, 2009 Journey to Freedom: A Boat People Retrospective symposium sponsored by the Library of Congress’ Asian Division along with many Vietnamese-American organizations. April 28, 2009 - H. Res. 342 passes in the House of Representatives. April 30, 2009 - U.S. Senator Jim Webb (Virginia) introduces S. Res. 123 calling for the designation of May 2, 2009 as Vietnamese Refugee Day. S. Res. 123 passed that same day. According to the 2010 US Census there are 1,737,433 Americans with Vietnamese ancestry. The Vietnam Center and Archive is not responsible for content on external websites.